Parallel Studios brings regional, national and international New Media Arts to New Mexico through Currents: The Santa Fe International New Media Festival, an annual, citywide event which includes exhibitions, multimedia performances internships, workshops, panel discussions, docent tours and educational programs that reach out to the schools and to the community. Digital technologies are transforming contemporary fine art, having become a powerful addition to many artists’ mixed media tool kits. This exhibition brings together an exciting group of contemporary artists who reveal the inventive, multi-dimensional array of what’s possible, from collage to encaustic to prints. Artists include Jeff Brice, Robert Campbell, Nichole DeMent, Dionne Haroutunian, Iskra Johnson, Amanda Knowles, Claudia Meyer-Newman, Barbara Robertson, Stephen Rock and Karin Schminke. The Frye Art Museum is pleased to celebrate thirty-six exceptional Seattle artists in Chamber Music curated by Scott Lawrimore, the Frye’s new Deputy Director, Collections and Exhibitions, in his inaugural exhibition at the Museum. Julie Alexander, Sharon Arnold, Byron Au Yong, Bonnie Biggs, D.W. Burnam, Robert Campbell, Jaq Chartier, Carl Chew, Claire Cowie, Anne Focke, Klara Glosova, Cable Griffith, Francisco Guerrero, Todd Jannausch, Shaun Kardinal, Carolyn Law, Margie Livingston, Greg Lundgren, Norman Lundin, Amanda Manitach, Alan Maskin, Ries Niemi, NKO, Matthew Offenbacher, D.K. Pan, Mary Ann Peters, PUNCH Gallery (Renee Adams, Howard Barlow, Justin Beckman, Justin Gibbens, Joanna Thomas), Bill Ritchie, Serrah Russell, Norie Sato, Rafael Soldi, Sierra Stinson, Michael Van Horn, Joey Veltkamp, Jamie Walker, and Robert Yoder. Each artist created a newly commissioned art work in response to musical compositions based on James Joyce’s volume of poetry entitled Chamber Music. The artists included in the exhibition span generations and reflect a broad aesthetic spectrum. Uniting them is a shared dedication to artist-generated activities that strengthen Seattle’s arts community beyond their own art practices. Chamber Music is both a celebration of individual mark-making and a cooperative composition about love for the City of Seattle and how artists choose to leave their mark on it. Kūkai* is a new collaboration between digital media artist Robert Campbell and ceramic sculptor Yuki Nakamura. Kūkai is an extension and elaboration of some of the revisited experimentations and ideas generated during their six-month residency in 2006 and an installation at SOIL Gallery in Seattle in 2012. Campbell and Nakamura developed ideas of experimental video projection with cast sculptures exploring Mylar, which creates afterimages in a reflected underworld. Kūkai is a reference to an influential 8th-century Japanese Buddhist monk. During a long and intense meditation in a cave, he saw the flat horizon where sea and sky meet. He chose the name Kūkai for himself. Ku means Sky, Kai means Sea. "We live directly across Puget Sound from one another- one on Vashon Island, the other in the Old Town district of Tacoma. Sea and sky are omnipresent in our daily imagery: as we watch the floating forms of ships, tankers, and drifting objects, we think of the sea that links the Pacific Northwest with Japan, and the parts and pieces of homes washed away during Japan's recent tsunami which are now arriving on these shores. The forms that we are reactivating are based on traditional Japanese wood joinery: forms that create bonds that hold parts together. We are basing our approach to combining our respective art forms on the linkage between these general ideas." Their first collaborative project was for the 2006 New Works Laboratory, a program between 911 Media Arts Center and the Henry Art Gallery that pairs a visual artist working in traditional media with a digital media artist experimenting with new technologies to co-create and exhibit new and innovative works of art. 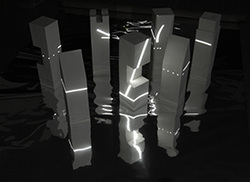 They created Floating Plaster / City Motion, a multimedia installation comprised of video, audio and cast sculptures incorporating three synchronized video projections. The work integrated sculptural formal aesthetics with architectonic video projections of animated imagery culminating in the creation of an evocative and dynamic installation. *This project is supported in part by Tacoma Artists Initiative Program.